Arizona. Georgia. Utah. Indiana. 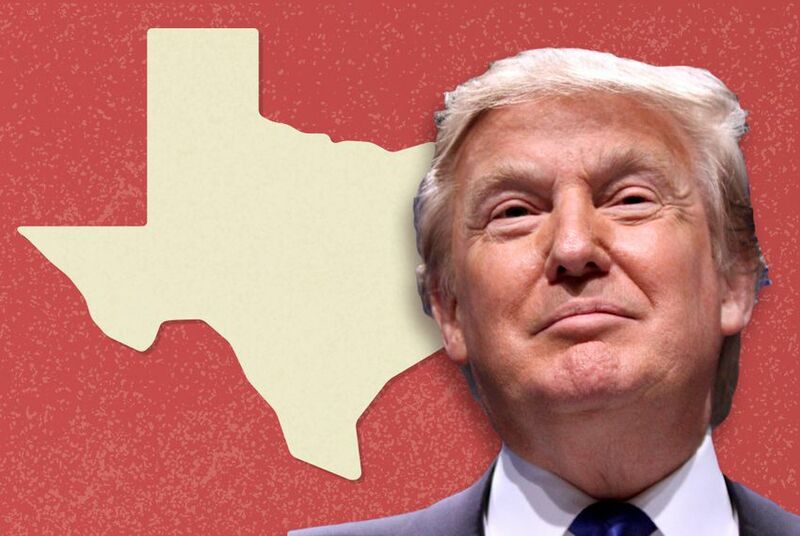 As Donald Trump's poll numbers collapse across the country, could he actually lose Texas to Hillary Clinton? No, say a raft of state and national Democrats. WASHINGTON — Arizona. Georgia. Utah. Indiana. Is Texas next? Across the country in recent days, GOP presidential nominee Donald Trump has suffered polling collapses in a slew of traditionally conservative states. The deterioration raises the question: Is Trump such a catastrophic Republican standard-bearer that Democrats could actually poach their ultimate white whale, the Lone Star State? That's the consensus of a raft of state and national Democratic insiders who discussed with the Tribune the possibility of Hillary Clinton winning Texas in November. “I think that it could set off a little bit of a panic among Republicans, but you’re not going to see banners flying and people marching into Texas saying, 'We’re gonna turn Texas blue,'" said Matt Angle, a Democratic operative with Texas roots. No matter the turmoil in Trump's campaign, the Democratic refrain from earlier in the summer remains the same: Texas is too expensive and too conservative to justify mounting a full-bore bid on Clinton's behalf. Spending millions on a Democratic push in Texas just doesn't add up. “I don't think it’s logical because I think they’re not going to make anything happen in Texas,” said Matthew Dowd, an Austin-based operative with experience in both Democratic and Republican politics. A recent visit to Austin by Democratic vice presidential hopeful Tim Kaine and a new PPP poll (which is an autodial poll and controversial to many statisticians) showing Clinton within six points of Trump mixed to form a cocktail of excitement for some state Democrats. Skeptics, and there are many, note that Democrats are looking to take money out of Texas from donors, not put it in. And the poll reflected Trump's weakness, not Clinton's strength. Democrats do not need Texas to win the presidency. If Clinton’s polling dominance holds into the fall, the party will have dozens of paths to the 270 Electoral College votes needed to win without Texas. Instead, the yearslong national Democratic dream is that putting Texas into play would force Republicans to spend resources protecting their dominance. Maybe someday. For now, it is much less expensive for Democrats to compete piecemeal for smaller states like Arizona, Georgia, Utah and Indiana, which generally feature down-ballot Senate and House races that would benefit from presidential campaign spending. In comparison, Texas has only one competitive federal seat, the Texas 23rd Congressional District, in the southwest part of the state. If Clinton can't win Texas, though, a strong showing might still sow seeds for the future, and that could justify sending a little Democratic money Texas' way. A Texas ally of the Clinton team argued that Kaine's visit indicates how seriously the campaign is watching the state. It’s an interest dating back 44 years, to when Bill and Hillary Clinton worked in Austin and San Antonio on the 1972 George McGovern campaign. The Clinton campaign has staff on the ground in Texas, although a spokeswoman declined to say how just many people. Clinton ads have popped up on Texas cable television screens, but a pair of Clinton-aligned sources caution that the ads are part of a larger national buy. Some in the pro-Texas contingent argue that if states like Ohio and Florida look to be runaways for Democrats, there might be extra money to throw at Texas, especially given that Democratic super PAC spending has exploded since 2012. But mostly, they argue, a strong 2016 showing could have governing implications. A Clinton rising presidential tide could lift margins in down-ballot federal races and spook Republican members of Congress into a more collegial posture than the hardline GOP stance of the Obama years. Still, it’s hard to underscore just how beaten down many state and national Democrats are over the 2014 Texas gubernatorial race, when then-Attorney General Greg Abbott blew then-state Sen. Wendy Davis out of the water. The melancholy and measured expectations are palpable, and these Democrats just want progress. So, what would an incremental victory look like for Texas Democrats on Election Day? Party infrastructure was the mantra in several interviews. The aim is to excite dormant Texas Democratic voters into volunteering for the first time in a generation, even if it is out of distaste for Trump. Even now, Texas volunteers are phone banking to battleground state voters elsewhere in the country. “We know it’s going to be a multi-cycle endeavor, but these numbers reinforce that we are making significant movement, particularly with Texas’ diverse new majority,” said Manny Garcia, the deputy executive director of the Texas Democratic Party. State Democrats are also cautiously hopeful they can make gains in the Legislature, and maybe lay the groundwork for a viable campaign against U.S. Sen. Ted Cruz in 2018 when he is up for re-election. Amid the cautious optimism, Democrats are willing to concede that anything is believable given the erratic nature of the Trump campaign. Former U.S. Rep. Martin Frost, an Arlington Democrat, echoed many Democratic insiders when he said he has heard no chatter about competing for Texas in the fall.